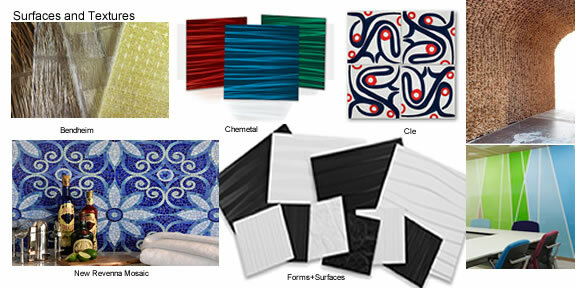 To create beautiful environments, designers use an array of textures and colors on surfaces. All surfaces have texture. Physics defines texture as a characteristic that creates friction. Like this, it translates into the design world in that it catches the eyes and makes our minds explore the environment in more detail. Texture stimulates both sight and touch senses. Texture is made by grinding, polishing, cutting, etc. Different textures can increase interest in a composition by adding variety, and can give the illusion of different materials such as metal, leather or sand. Texture can also be added through the viscosity of colors. A fluid with high viscosity can give a surface a three dimensional quality, which makes them look more realistic. Another way to add texture to an environment is through works of art. They add a physical property that may also provide emotional context to the viewer. This is important because it can change the attitude of the viewer towards their current environment and can also be replaced according to season. All in all, our perception of texture is influenced by our senses and the materials around us. Texture can make a room more interesting by adding value and color contrasts that can make a unique organizational composition.